The Flagship Diner has been a Queens fixture for more than five decades. QUEENS — A Briarwood diner that has served Queens residents for more than five decades is facing a bitter court battle with its new landlord who is trying to get rid of it before its lease expires in more than two years, the owners said. 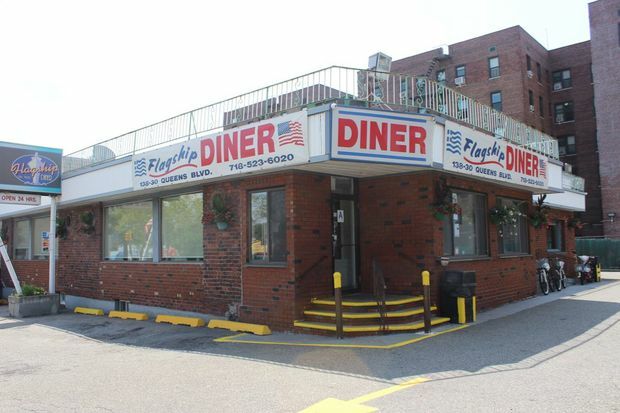 For 53 years, The Flagship Diner, at 138-30 Queens Blvd., has been a popular hangout for the community, as well as lawyers and court officers working at the nearby Queens Criminal Court. But the owners said the diner has been forced to fight for its survival ever since Jamaica-based White Rock Management group purchased the site for $6.125 million last year, with plans to knock down the eatery and replace it with a seven-story, mixed-use apartment building featuring 64 units. Shortly after acquiring the property, White Rock Management filed an application with the Department of Buildings to demolish the diner, which was approved on July 26 last year, and then another application to replace it with a new building, which was approved on June 9 this year, according to city records. The diner's owners said they were hoping to keep their business open until their lease expires in October 2019. But Jimmy Skartsiaris, who co-owns the eatery with Vincent Pupplo and Frank Lountzis, said the new landlord began harassing them "the minute he bought the building." First, the landlord wanted to buy them out, offering each of them $100,000, but they turned it down, the owners said. Since then, they said, the landlord sent them several "notices to cure," requiring them to address a variety of issues within five days if they wanted to avoid eviction. The owners said they were forced to hire a lawyer who was able to obtain a “Yellowstone injunction” for each notice which temporarily suspends the time period during which they must address the issues. The first notice pertained to 13 boiler-related violations the diner began receiving in 1993, some of them issued before the trio bought the business in 1994, according to the owners and the Department of Buildings website. Twelve of those violations are still active, according to the DOB, and the owners are currently working on resolving the issue, they said. The landlord then sent them another letter saying that their parking lot, sidewalk and back steps are in disrepair and have to be ripped up and replaced within five days, followed by a note accusing them of not having proper liability insurance — claims that the diner owners denied. “In my opinion they are trying to bankrupt us in court so that we can’t stay in business,” said Vincent Pupplo​. Last month, the restaurant owners decided to strike back and filed a lawsuit in the Queens County Supreme Court accusing the landlord of harassing them. They also want the landlord to pay their legal fees. The first hearing is scheduled for Sept. 19. White Rock Management did not return a phone call seeking comment. Meanwhile, the diner also started a petition asking customers for support, which they said was signed by more than 1,300 patrons as of Thursday, Skartsiaris said. On Sept. 12, at 11 a.m., the owners are also planning to organize a rally in front of the diner asking locals for support. “It’s not fair to the people and it’s not fair to us,” Skartsiaris said, adding that the 24-hour restaurant employs around 35 workers. Customers said they can’t even imagine that the diner may one day close.